Inspired by the Latin word Regius, or regal, Brooklyn based Regalis Foods is dedicated to purveying natures rarest gems to an extensive list of Michelin star restaurants, home cooking enthusiasts and truffle lovers world-wide. 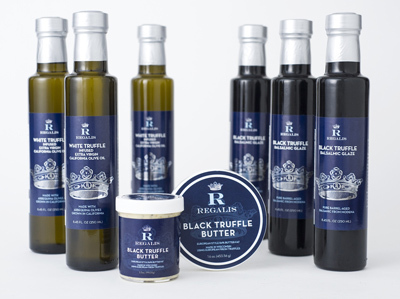 Their line of naturally infused truffle oils, baslamics, butters and honeys are unparalleled in quality. Sourced from the finest imported and domestic suppliers, Regalis takes complete control of the process, producing the finished products here in the US. There are no artificial ingredients, synthetics or aromas so commonly found in most truffle products in the market today. After importing his first truffles from Italy as a high school student in Arkansas, Ian Purkayathsa began to build his business, starting with local chefs and then building a client list throughout the US. After graduation he moved to New York to continue his work and is now based in Brooklyn. Known as the Truffle Prince of NY, he is one of the leading importers and purveyors of fresh truffles and other delicacies to the US market. In the summer of 2012, Ian formed Regalis Foods to develop and market the finest in truffle products. White Truffle Extra Virgin Olive Oil: First cold-pressed, golden hued, small estate grown California Arbequina extra virgin olive is naturally infused with fresh white truffles from Le Marche, Italy. Rich, with a creamy textured earthy finish. 250 ml, 12 per case. 18 yr aged Balsamic from Modena, Italy naturally infused with black winter perigord truffles, thick, luscious and aromatic, dense and classically flavored. 250 ml, 12 per case. Small batch, Wisconsin made truffle butter, a rich and a luxurious blend of 84% butter fat butter (translation = extra creamy) glittered with black truffles from Abruzzo, Italy. 3.5 oz, 12 per case; 1 lb bricks, 15 per case. 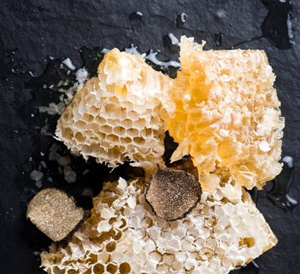 Completely edible honeycomb with deep golden hued star-thistle honey, is infused with fresh black Tennessee truffles from Chuckey, Tennessee. Perfect for a cheese board or pair with ice cream 11 oz, 12 per case. Hand harvested flake salt from the cold, clear waters of Oregon blended with earthy, nutty and aromatic dried black truffles. Also available truffle infused Oregon sea salt and kosher style salt. 1 lb bulk. inquire for selection and availability. Telephone: 206-522-1493 | Seattle, WA | © 2013, Eric Stone Specialty Sales, Inc.